I really like this bag. Purple is my favorite color anyways, and I love purses. This is definitely on my list of things to make. This is a really nice bag pattern, and definitely on my list of ones to make. Can you clarify the directions for the strap? Is it just a sc tube because it doesn't appear that way in the picture. Yes, the strap is a crocheted "tube" known as I-Cord. If you look at the posting for I-Cord there is a closer photo of some short sections and you can get a better look. Have finished crocheting the bag, but noticed I have eight loops while your photo has only four. Also, if I weave the cord in and out of all the eight loops, the sides tend to buckle up, so I weave at alternate loops instead. The overhand knot is quite big and bulky. Am I doing it right? Notice on round 29 it says you will have 8 loops. The bag in the photo has 8 as well. It is just the way it is folded that makes it look like there are only 4. Be sure to pull your overhand knot tight. 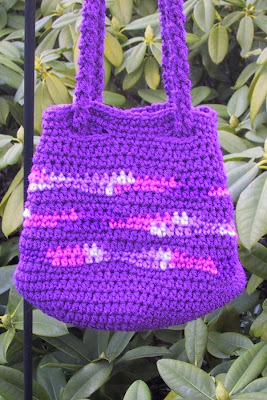 very pretty bag, i love how you put the variegated yarn here and there, it really adds a lot to the bag.